Why are we drawn to certain cities? Perhaps because of a story read in childhood. Or a chance teenage meeting. Or maybe simply because the place touches us, embodying in its tribes, towers and history an aspect of our understanding of what it means to be human. Paris is about romantic love. Lourdes equates with devotion. New York means energy. London is forever trendy. Berlin is all about volatility. Its identity is based not on stability but on change. No other city has repeatedly been so powerful, and fallen so low. No other capital has been so hated, so feared, so loved. No other place has been so twisted and torn across five centuries of conflict, from religious wars to Cold War, at the hub of Europe’s ideological struggle. Hence history broods in Berlin. Its legends, both real and imagined, stalk the streets: Lenin drinks at the same café as David Bowie’s heroes, Wim Wender’s trench-coated angels wing above torch-lit Nazi processions, Dietrich shops alongside Sally Bowles at KaDeWe, le Carré’s George Smiley watches the packed trains leave for Auschwitz. I first came to the city because of two of its legends. In the late 1970s I was fresh out of film school, a young assistant director on Just a Gigolo, a movie starring David Bowie and Marlene Dietrich. At the time Dietrich was 77 years old, a recluse, living in isolation in Paris. Seventeen years had passed since her last appearance in a movie. Fifty years since von Sternberg had cast her in The Blue Angel. It took the producer six months to convince her to accept the role. Every time he telephoned her apartment, a woman would breath into the receiver. The ‘maid’ was Dietrich, of course. We were told that she was too busy, that she was writing her memoirs. In truth she was frightened of being unable to live up to her legend, frightened of the toll of years. But in the end the chance to sing on screen one of the songs from her cabaret days proved to be too enticing. At first the old woman who mounted the steps of the film studio brought back no memories of Shanghai Express. She wore a tired denim suit and hid by the door. Her lips quivered as we were introduced to her. She refused to take off her dark glasses. The makeup artist moved to her side, and spirited her away into the dressing room. Two hours passed before she reappeared, wearing a wide brim hat and deep veil over her face. In costume she began to find her confidence, the clothes helping to ease her into the role. She walked onto the set without assistance, sat down and let her long skirt — split to the thigh — slip open. A woman of half her age would have been satisfied with those legs. As the crew tried not to stare, a smile fleeted across her face. 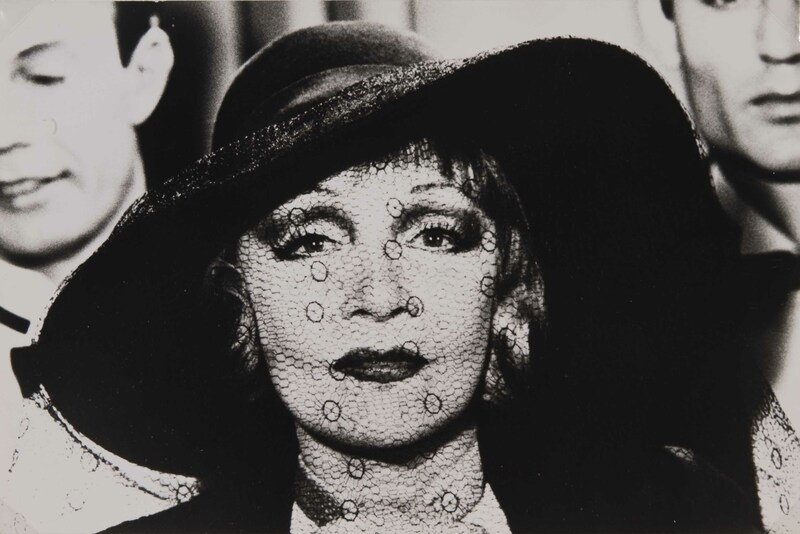 Marlene Dietrich in Just A Gigolo. Image is in the public domain, via Art Finding. I looked through the lens, and my eyes deceived me. There was no old woman standing before me. Instead the veil and a soft focus filter had transformed her. The key light caught her eyes and I saw the star of Blonde Venus and Touch of Evil, the legendary Dietrich. In all it lasted maybe three minutes, but the intimacy stayed with us. After the cameras had cut, we remained silent. Then burst into spontaneous applause. Dietrich smiled once more and the photographer shot stills until he started to shake. Then she gathered herself and left the set, the last set that she would ever perform on, the crew standing in a line to the door, applauding.